ICTBroadcast allows to its user to set Custom Caller ID that changes the outgoing Caller ID according to the destination. This allows users to be identified as if they are dialing from their personal phones. This could also be used to hide the identity of the caller that is we discourage ethically, however. 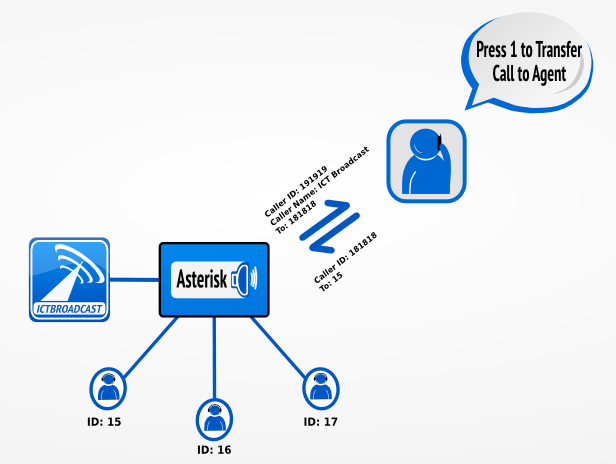 ICTBroadcast allows various options to set Caller ID in different scenarios. For example, Caller ID can be set while outbound broadcasting and similarly, you may also need to set Caller ID when a call is transferred to agent. Administrators can set these options from system configurations. Default CallerID: Sets default caller id for outbound campaigns. Admin can set any value here and it will be used as global caller id. Admin can also use tokens (variables) here such as [campaign:callerid]. It tells system to use caller id set by individual campaign. CallerID on Transfer: Set caller id on transfer. For example, when call is transfered to call center / Agents. Admin can use [contact:phone] to show call recipients phone number when they are transfered to agents. Caller ID is the number that appears when a call is received by recipient . while running telemarketing campaigns through ICTBRoadcast, admin assign a unique DID to each user for inbound campaigns and said DID numbers can be used as CallerID. When a call center receives an Inbound call, Caller ID is used to identify the caller by matching their phone number to information in the call center software database and integrated CRM. Once this caller has been identified and relevant information about the caller has been acquired, the call is routed to the most appropriate Agent based on this information.